The Marantaceae are a family, the arrowroot family, of flowering plants known for its large starchy rhizomes. It is sometimes called the prayer-plant family. Combined morphological and DNA phylogenetic analyses indicate the family originated in Africa, although this is not the center of its extant diversity. The plants usually have underground rhizomes or tubers. The leaves are arranged in two rows with the petioles having a sheathing base. The leaf blade is narrow or broad with pinnate veins running parallel to the midrib. The petiole may be winged, and swollen into a pulvinus at the base. The inflorescence is a spike or panicle, enclosed by spathe-like bracts. The flowers are small and often inconspicuous, irregular, and bisexual, usually with an outer three free sepals and an inner series of three petaloid-like segments, tube-like in appearance. The fruit is either fleshy or a loculicidal capsule. The APG II system, of 2003 (unchanged from the APG system, 1998), also recognizes this family, and assigns it to the order Zingiberales in the clade commelinids in the monocots. The Marantaceae are considered the most derived family in this group due to the extreme reduction in both stamens and carpels. The family consists of 29 genera with about 570 known species, found in the tropical areas of the world except in Australia. The biggest concentration is in the Americas, with seven genera in Africa, and six in Asia. Arilated seeds of Marantaceae are dispersed mainly by birds and mammals. In Amazonia, crickets and ants are important secondary dispersers. 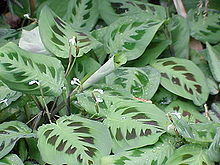 Rosmarinic acid can be found in plants in the family Marantaceae such as species in the genera Maranta (Maranta leuconeura, Maranta depressa) and Thalia (Thalia geniculata). The most well-known species in the family is arrowroot (Maranta arundinacea), a plant of the Caribbean, grown in parts of the Caribbean, Australasia, and sub-Saharan Africa for its easily digestible starch known as arrowroot. It is grown commercially in the West Indies and tropical Americas. Several species of genus Calathea are grown as houseplants for their large ornamental leaves, which are variegated in shades of green, white, and pink. Other genera grown for houseplants includes Stromanthe and Maranta. Calathea lutea has tough, durable leaves used to make waterproof baskets, and in the Caribbean and Central America, its leaves are used for roofing. Two Mexican species - C. macrosepala and C. violacea - have flowers that are cooked and used as vegetables. C. allouia or leren, from the West Indies and tropical America, is known as sweet corn root for its edible tuber. Schumannianthus dichotomus is used for weaving mats to use on floors and beds. ^ Andersson, L; Chase MW (March 2001). "Phylogeny and classification of Marantaceae". Botanical Journal of the Linnean Society. 135 (3): 275–287. doi:10.1111/j.1095-8339.2001.tb01097.x. ^ Santana, Flávia Delgado; Baccaro, Fabricio Beggiato; Costa, Flávia Regina Capellotto (2016). "Busy Nights: High Seed Dispersal by Crickets in a Neotropical Forest". The American Naturalist. 188 (5): E126–E133. doi:10.1086/688676. ISSN 0003-0147. PMID 27788347. ^ Abdullah, Yana (2008). "Occurrence of rosmarinic acid, chlorogenic acid and rutin in Marantaceae species". Phytochemistry Letters. 1 (4): 199–203. doi:10.1016/j.phytol.2008.09.010. Andersson, Lennart (1981). "The neotropical genera of Marantaceae. Circumscription and relationships". Nordic Journal of Botany. 1 (2): 218–245. doi:10.1111/j.1756-1051.1981.tb00692.x. ISSN 0107-055X. Wikimedia Commons has media related to Marantaceae. This page was last edited on 23 February 2019, at 22:45 (UTC).